Christmas time is here, spaghetti and gondola boats are everywhere. Venice is a magical wonderland during the Christmas season. 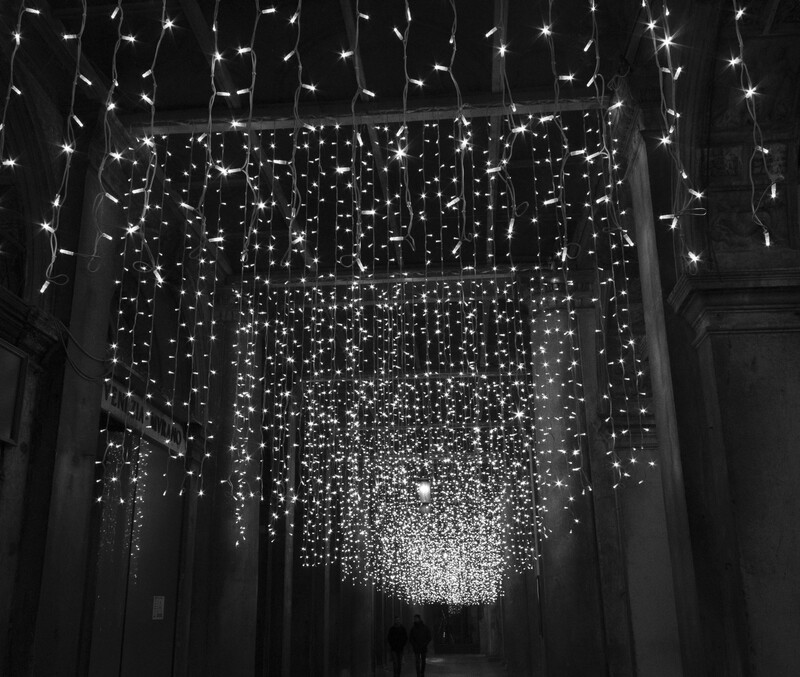 Holiday lights dangle underneath walkways and Christmas music can be heard in stores and in restaurants. 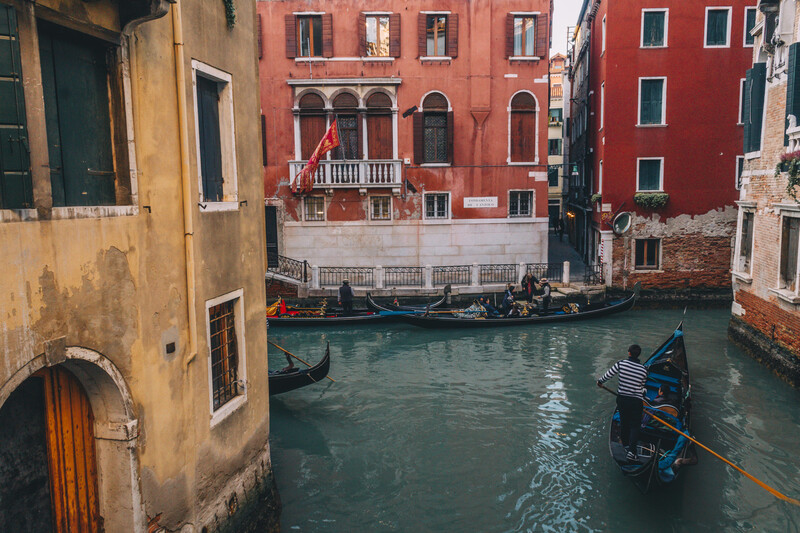 Venice is a unique place primarily because of the origin of the city. Venice is built on preexisting marshy islands by refugees needing to escape to attacks of the barbarians. These islands have become a fascinating attraction for hundreds of thousands of visitors it brings in each year. Water that appears inviting enough to swim in, until I discovered the water died regularly with green coloring. 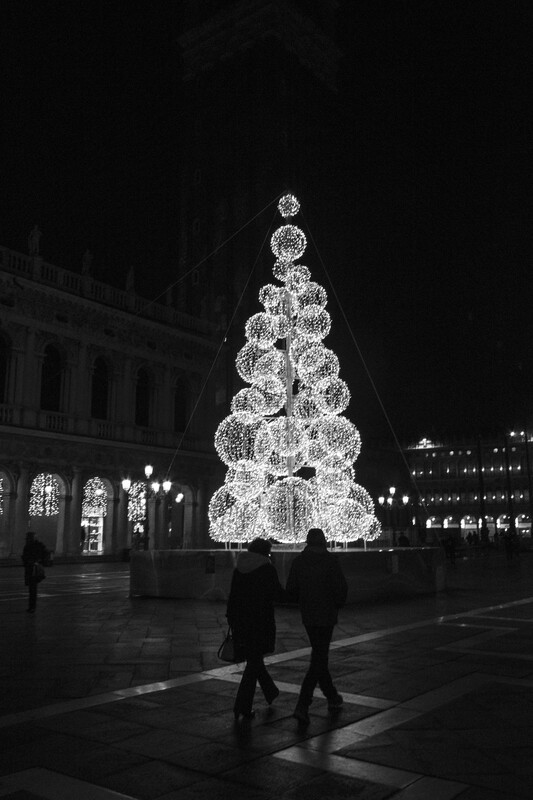 The winter is an ideal time to visit Venice because the tourists dwindle out and the Christmas lights come on. 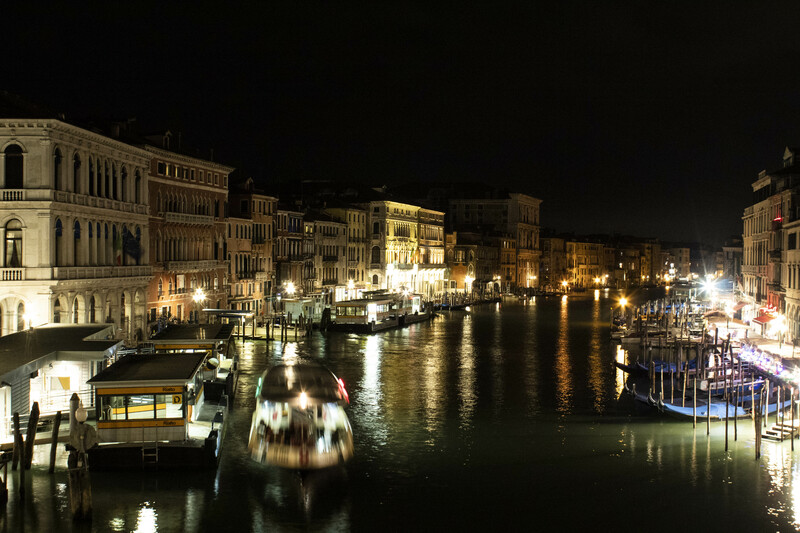 Now that it is the beginning of December, the crowds of Venice have died down dramatically. The markets, streets, Campos, and piazzas are all much quieter now than they are during the high tourist seasons of May through September. 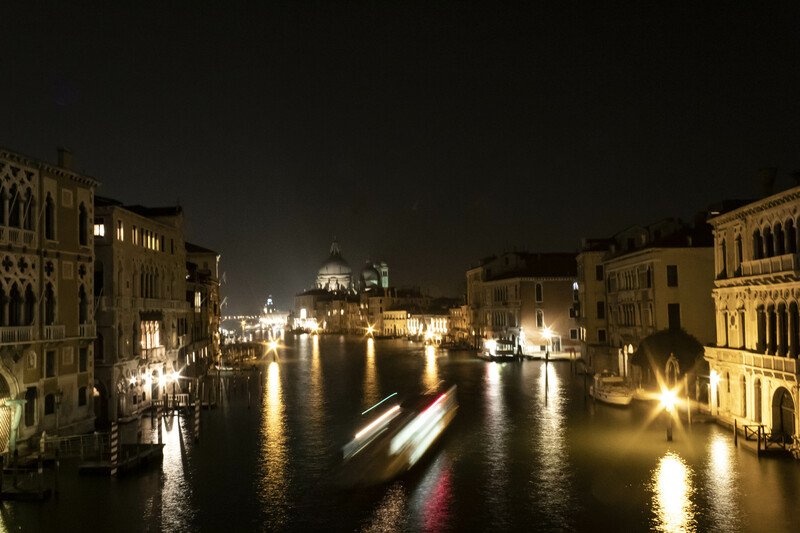 Walking during the night around Venice is a dream. Empty gondolas turned in for the evening, sway back and forth from the current of the ocean. Couples stroll through the streets hand in hand bundled in up from head to toe. My face turns red from the breeze at the water’s edge. 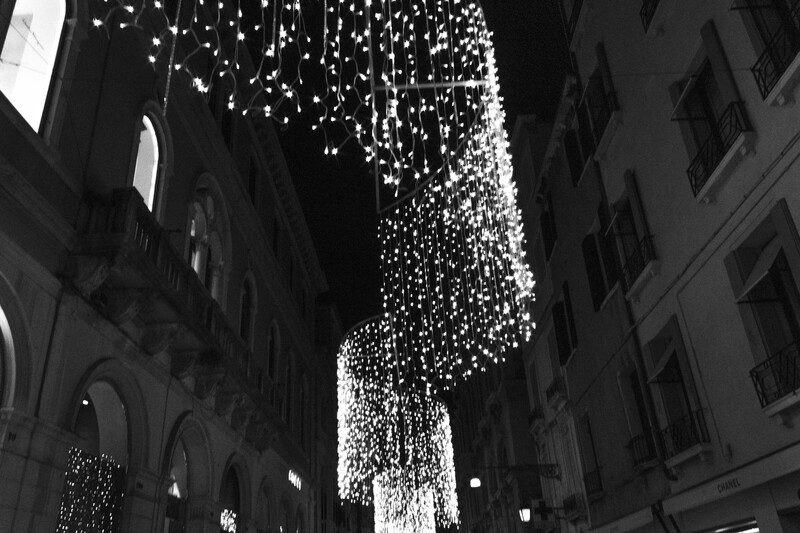 Night time is pristine time to see the Christmas lights decorating the city. 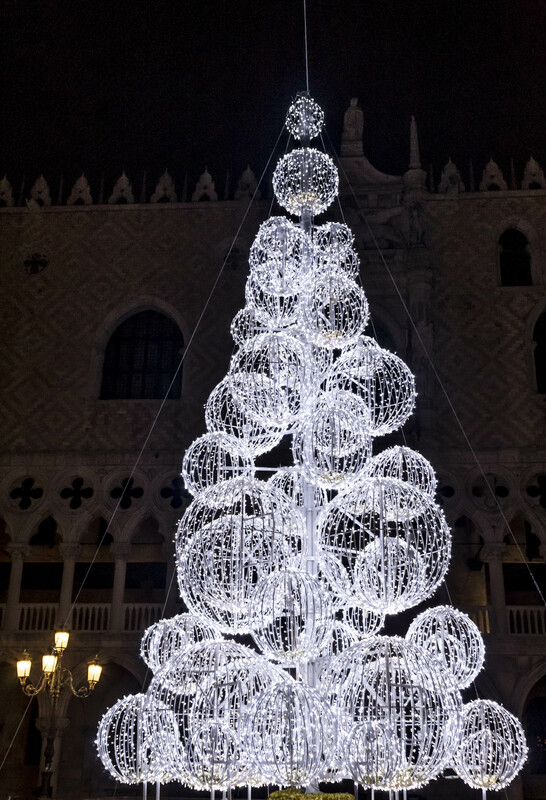 The Christmas tree near San Marco Plazza stands tall, appearing as if it were giant snowballs stacked on one another. Visitors of Venice pose with selfie sticks beside the tree. There are no cars on the roads because boats are the main mode of public transportation, which is an extremely odd experience for me. In fact, there is no other way to get to Venice other than by boat. I took a boat taxi to other islands, just like I would take the Subway in New York City. Every couple of blocks there is a bridge with boats whizzing underneath it. Eclectic shops line on each side of the street. The handmade bookshops have the intense aroma of new leather. As someone who has made her own books before I am impressed at the attention to detail these bookmakers put into their products. 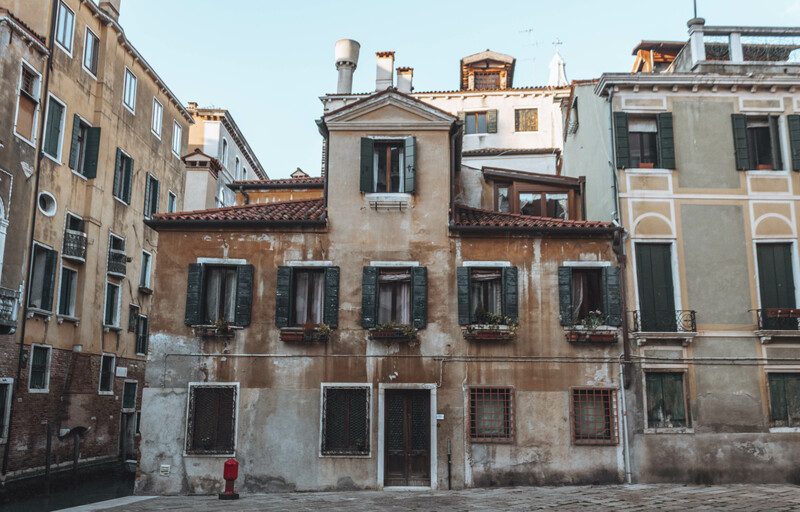 Passing by residential areas is interesting because the houses are rectangular buildings and much taller than they are wide. All of the buildings appear to have melted into one another. You might have a brown building touching a red building. For lunch, I sat down at a restaurant and warmed up my thighs that had grown increasingly colder as the day progressed as I ordered and ozzy mushroom pizza. If you are looking to save money, splitting a pizza is an excellent way to go. Usually, the pizzas are too big for me to each by myself anyways. There is always something interesting to discover in a new city. During my time in Venice, I went to a Willy Ronis photo show. I am blown away at such an excellent photography Ronis was during his lifetime. 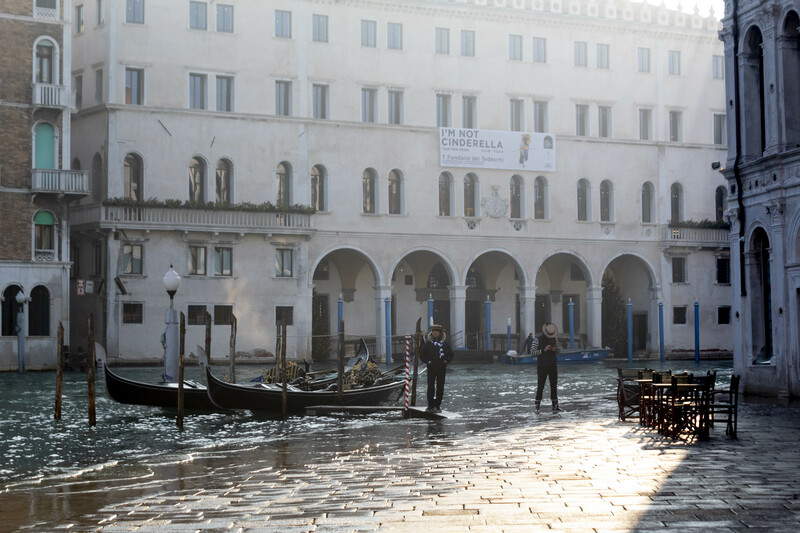 Many of his best photos were shot in Venice. As an aspiring photographer, his work inspired some of the shots I took during my time in Venice. I am certainly not alone. 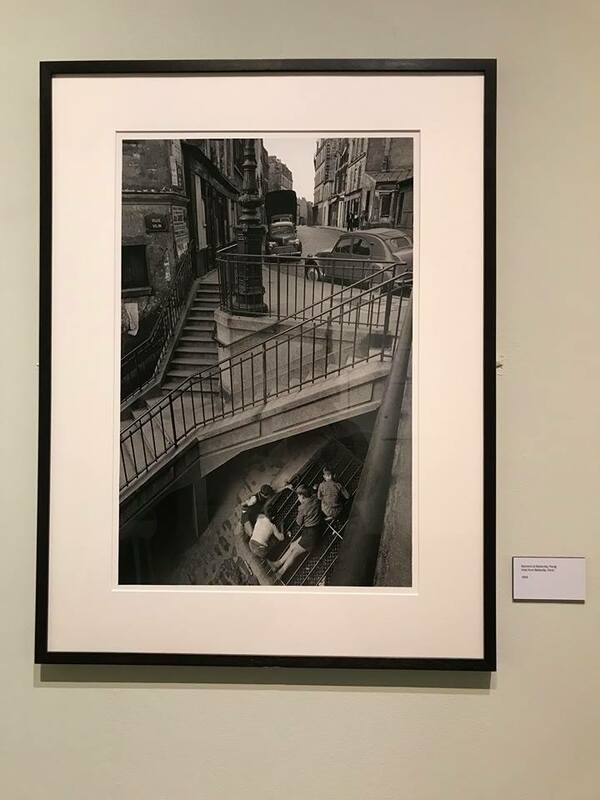 Walking at night I see several people every few blocks with a tripod just hoping for a photo as good as Willy Ronis’s. 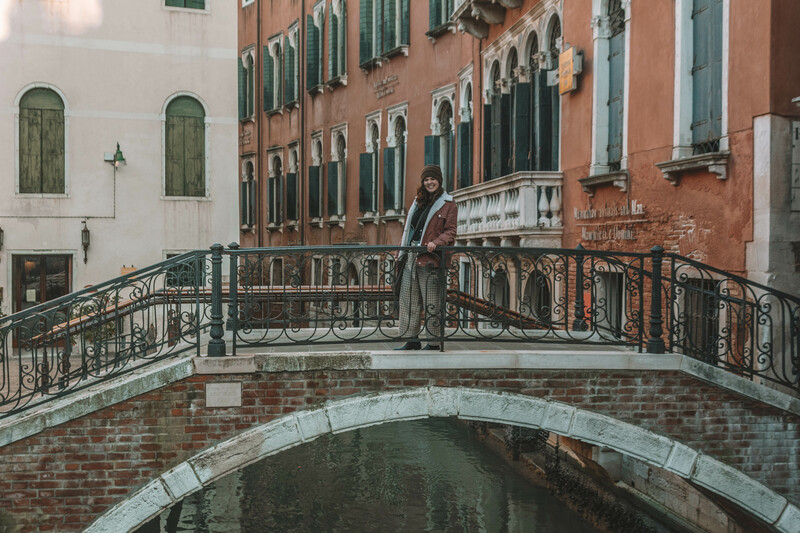 While you are in Venice you can find things to do that may not have been on your original agenda. That is the beauty of getting to know a new city. 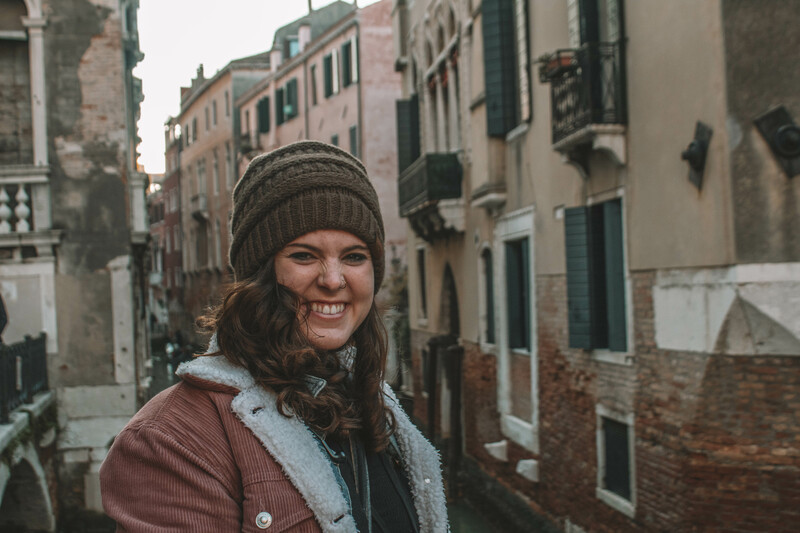 I hope you enjoy getting to know Venice at Christmas time as much as I did.